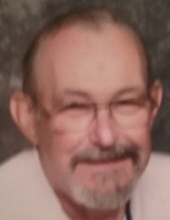 FRANKTON, IN- Paul B. Doan, 80, passed away at his residence on Monday, November 26, 2018 following a brief illness. He was born on December 25, 1937 in Greentown to Ralph and Marie (Weaver) Doan and has lived in the Elwood-Frankton area most of his lifetime. Paul was graduate of Elwood High School-Class of 1956. He served his country in the United States Army. He retired from Delco-Remy in 1993 after 32 years of employment. Paul was a member of the Grace Methodist Church in Elwood. He enjoyed collecting NASCAR memorabilia and Jeff Gordon was his favorite driver. He has been an avid bowler for a number of years and was the #1 fan of his grandkids athletic events. Per Paul’s request, private family services have taken place followed by cremation. A private inurnment service with military honors will take place at the Garden of Serenity Columbarium in Park View Cemetery in Alexandria. Memorial contributions are suggested to the American Cancer Society at https://www.cancer.org/. Owens Funeral Home is honored to care for Paul and once again serve the Doan family. To send flowers or a remembrance gift to the family of Paul B. Doan, please visit our Tribute Store. "Email Address" would like to share the life celebration of Paul B. Doan. Click on the "link" to go to share a favorite memory or leave a condolence message for the family.